Reports indicate that the Prime Minister of Israel, Benjamin Netanyahu, and a senior executive at Walmart discussed the possibility of the largest retailer in the world investing in the Middle Eastern country. This was during the recently concluded World Economic Forum which took place in Davos, Switzerland. According to the economic adviser of Netanyahu, Avi Simhon, the idea of Walmart opening retail outlets in Israel was discussed besides having the retailer invest in Israeli tech firms. “What’s become clear after the Trump tax cut is that we can’t sit back and watch. We need to make some drastic changes here, too, to make sure we stay attractive to overseas investors,” said Simhon. The Middle Eastern country has been involved in efforts of diversifying its economy as well as courting international investments. Israel’s international investment pitches have however sometimes been unsuccessful during to the tense relationships that the country has with its Arab neighbors. Some of the multinationals who have made investments in Israel, especially in research and development, include Google, Apple and Intel. Retailers have however not been on the list due to the country’s relatively small economy as well as the fact that it can’t be turned into a regional hub owing to the difficult relations it has with neighbors. However the population of Israel is growing fast and as it gets richer, consumption will rise making it attractive for retailers. Besides the Walmart executive Netanyahu also met with executives of major firms in South Korea and Japan in Davos. Currently most of investments in Israel are from Chinese and U.S. companies. And besides courting international investments Israel is also considering tax reforms. Simhon is expected to lead an effort aimed at overhauling the tax system of the Middle Eastern country and a report will be submitted to the Prime Minister in the coming weeks. The courting of Walmart by Netanyahu comes in the wake of the giant retailer dropping the hyphen in its corporate name. This means that Wal-Mart Stores, which has been the corporate name since 1970, will now become Walmart Stores Inc, following the filing of new incorporation documents in the state of Delaware. Though only the corporate name is being changed, the hyphen was dropped in merchandise, bags, advertisements and storefronts in 2008. 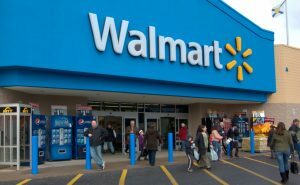 The change in corporate name seems to be a reflection of the transformation Walmart has undergone from being merely a brick-and-mortar retailer to an online retailer as well with various online brands under its belt.